There’s a lot to love about the bloodhound couple at the center of this cozy mystery. Michelle Cox’s cozy mystery A Ring of Truth brings 1930s Chicago—with its hot jazz, art deco buildings, cigar-chomping gangsters, and big cars—to life. It provides a double escapism, allowing modern readers to live in a fantasyland of the past while simultaneously removing its own characters from the cruelest blows of the Great Depression. Set in the Chicago suburb of Winnetka, A Ring of Truth is about a quiet crime that soon becomes a major scandal. When a servant’s priceless ring disappears, Henrietta Von Harmon, one of the novel’s two main detectives, begins investigating. 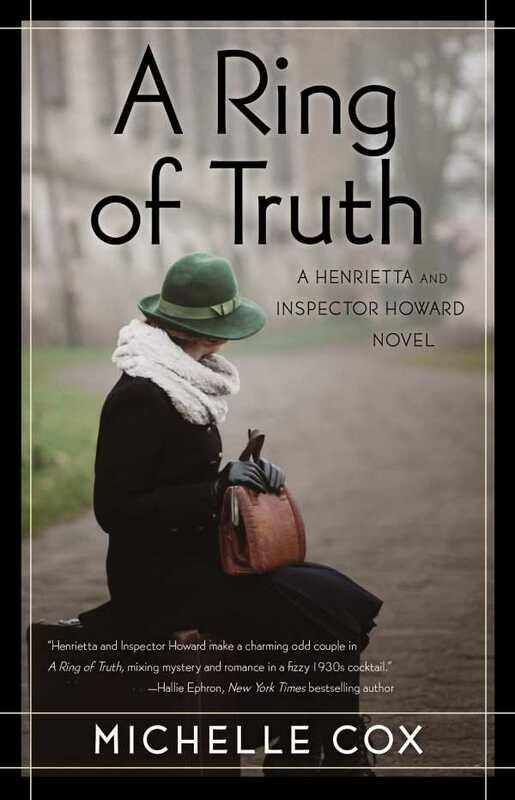 Along with her lover, Inspector Clive Howard, Henrietta helps to uncover a grisly and obsidian secret. In simple, sugary prose, Cox weaves together a Agatha Christie–like mystery within an overall framework about the complicated romance between Henrietta and Clive. In this second novel featuring the two lovebird sleuths, social class, love, and doubt become unifying themes. Specifically, Henrietta, a former taxi dancer and the daughter of a man who committed suicide after losing everything in the stock market crash, finds herself ill at ease at the posh Howard mansion. Indeed, Henrietta’s interest in the novel’s case is predicated upon her affinity for the mansion’s hired help. She becomes one of them, and while others turn up their noses, Henrietta takes a sincere interest in their triumphs and more frequent failures. The insular world of the Howard mansion allows for the crime to play out like a self-contained game, with logical rules and regulations. This is no mean street affair; A Ring of Truth is more crossword puzzle than crosstown expressway. As for Clive, he begins and ends the novel as a sort of halfway figure—neither fully comfortable with the upper crust life he was born into, nor totally a part of the rough-hewn, cynical, and proletarian world of city police work. Regardless, as with all “Golden Age” mysteries, A Ring of Truth eventually guarantees that the old order is maintained and some form of justice is achieved. The novel is enjoyable, with easily digestible prose that can be consumed in healthy portions and a narrative that moves at a brisk clip, though all of its intricate details and involved characters may be hard to recall after. There’s a lot to love about the bloodhound couple of Henrietta and Clive. A Ring of Truth puts the lovers through the wringer, and at one point, the relationship itself becomes a type of investigation. Both Henrietta and Clive have to weigh the evidence: one half saying that the relationship should end while the other half says the opposite. Given how this novel ends, it is likely that there are more mysteries on the horizon. A Ring of Truth certainly warrants a successor.